Unfortunately the price is now £6 each but we will keep to the old price for the adjustable bed mattress side retaining bars. 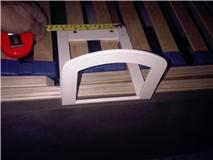 I have attached a picture to show the pitch of the clips which are approximately 104mm. Different manufacturers of adjustable beds vary the pitch, but only slightly, so.I suspect you may have measured the pitch of two pairs of slats instead of two individual slats. If this is the case then yes again. In order for us to simplify explanations and guide customers with a frequently asked questions about adjustable beds, would you object to your comments being used on our blog with your name and email etc removed? Thanks for this. It may be that I have not described my requirement well enough, its not the bars I am after, but the mattress retaining brackets, which screw onto the adjustable bed slats, are L-shaped, and have retaining clips/lugs as part of the bracket – there was a photograph of a white bracket on the adjustable bed blog entry I found. Looking at my bed, the slats are 2″ wide (seem to be slightly more than 50mm, so I am assuming 2″) with what I would guess is a 3″ gap between the slats themselves, giving a 7″ end to end distance (180mm). The adjustable bed was purchased from Argos a few years ago. In terms of this thread being on your blog, no problems (with name and address removed). Sorry for the late reply, but I’m still at work. Don’t worry, I fully understood, but the adjustable bed you have is not made to the same high quality as our adjustable bed mechanism. A 3″ gap between the slats sounds excessive but, if it does the job! Our adjustable bed mattress side retaining bars can still be used by cutting off the clips and screwing down through the main body of the plastic which will line up perfectly over your slats. Using the screws will make the clips obsolete. We can pre drill and countersink them for you and remove the clips. If there are any other adjustable bed product that would compliment your existing adjustable bed, check out our accessories http://www.bed-adjustable.co.uk/products/serena-height-adjustable-beds.html we have a range of very high quality pine, metal and upholstered headboards. Elasticated fitted sheets that are 97% cotton, ideal for adjustable beds. This entry was posted on Wednesday, October 27th, 2010 at 12:06 pm	and is filed under Adjustable Bed Accessories. You can follow any responses to this entry through the RSS 2.0 feed. You can leave a response, or trackback from your own site. Thanks for sharing such beautiful information. I have paid of this retaining bars before with my old bed. With my new electric bed, I no longer have to use it.